HIV-AIDS is an epidemic that causes an excessive load on the health care system. In the last decade, HIV has erupted worldwide. Homeopathy holds the potential for improving patients' well-being and prolonging life by ameliorating the draining side effects of anti-retro viral (ARV) drugs. This article attempts to bridge the gap between homeopathic and conventional therapeutic plans. 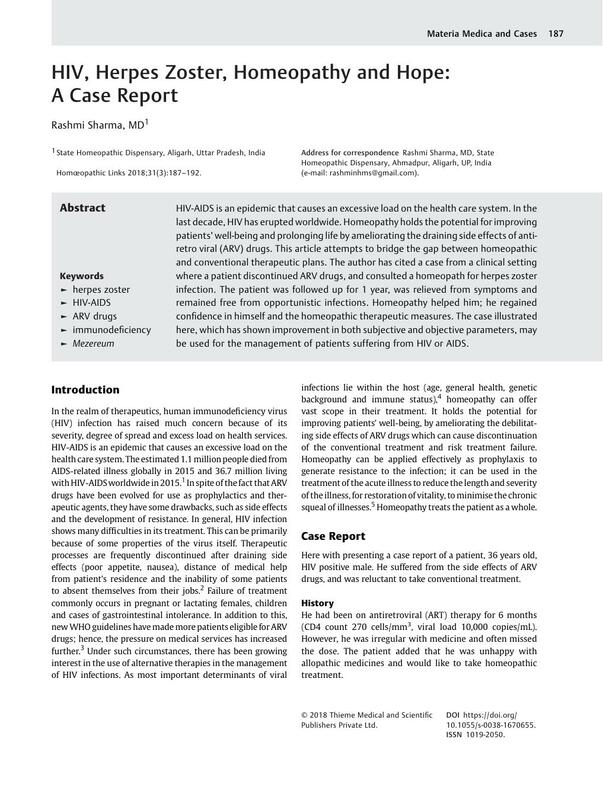 The author has cited a case from a clinical setting where a patient discontinued ARV drugs, and consulted a homeopath for herpes zoster infection. The patient was followed up for 1 year, was relieved from symptoms and remained free from opportunistic infections. Homeopathy helped him; he regained confidence in himself and the homeopathic therapeutic measures. The case illustrated here, which has shown improvement in both subjective and objective parameters, may be used for the management of patients suffering from HIV or AIDS.